So as I was working, my colleague who was fairly new called me and wondered why he can’t add two hypervisors into the same cluster and get HA to work right. Hypervisor 1 had HA ok but hypervisor 2 had a HA error. Now on further looking at the error I see the below pic. It clearly shows that the hypervisors are on separate segments on the network. Now lets all remind ourselves that HA wants to be on the same segment, the reason is that if the hypervisor fails over, the vms that are now on the good hyp should be able to use the network without any issues. Now you can over ride that by setting the das.allowNetwork where you can enter another subnet to talk to. 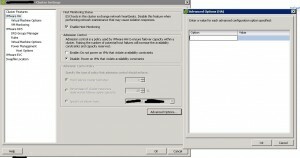 You can enter the das.allowNetwork custom setting in the HA advanced option shown below. Now the way to fix this was to get both the hypervisors on the same vlan which is underway. Previous Don’t forget that Snapshot! Next How to read vmkdumps?